Start the New Year with RV Travel In Mind. 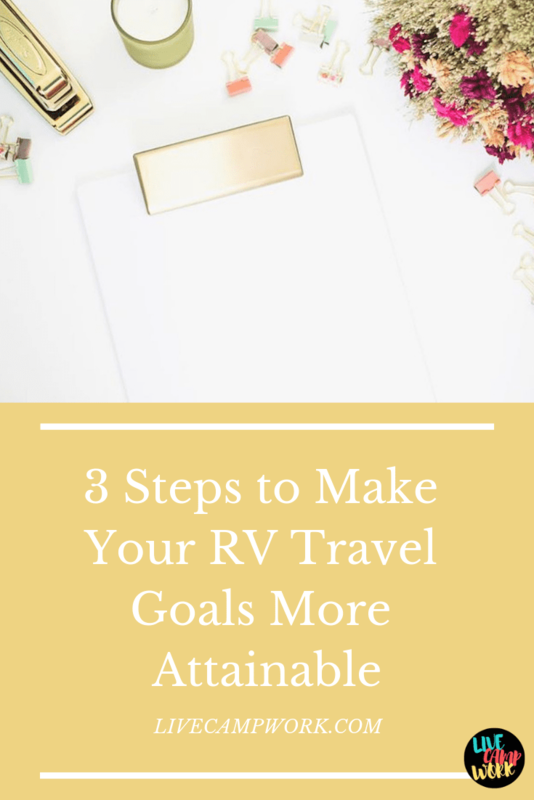 RV Travel is easy with attainable goals! Do You Have An RV Travel Resolution? This is the beginning of the New Year, and yet the end of another. The start of a brand-new adventure starts in the few moments right after the countdown and it is within these precious few moments that last year flashes before your eyes. You see all the ground you were able to cover. All the miles drive. All the words spoken. People met. New places discovered. And stories told. Your mind is flooded with the pictures of your journey- and not the ones that you shared on social media. The ones you held for just your family- the ones that explain the who, what, when, where, and why behind this whole big crazy family adventure. It’s in these few short moments, you realize that this year marks the beginning of a brand new adventure. One that you may not have even planned yet. So what does that mean for your next year of RV Travel? For me, it means I need to jump on it and get started with the planning of my goals for the upcoming year! Having a few well plotted goals in regards to RV Life & RV travel help me to stay on track and on course throughout the year! Are you making this the year you hit the road? Would you like this year to be different from the travel style of the last? Want to see and do more in the next 12 months than you did in the previous? What about doing more volunteer work this year? Are you planning to try Workamping or starting your own business? What will your RV travel resolution be for the next year? Everyone has goals we want to accomplish in the new year, and some of us will check these boxes off our ‘To Do Lists’ along with many others. But for many more, these resolutions will likely fall to the wayside due to one reason or another, and that is both disheartening and discouraging. Make it Simple: Long lists of goals are not the result we’re aiming for here. What you want for your New Year’s goals are a few (5-10 is good) short, simple and well thought out goals that are not only reasonable but also attainable. You want things that aren’t super easy to complete, but things that aren’t considered ‘shooting for the stars’ either. Think about where you want to travel in your RV this year. Do you have an RV already? Do you need to buy your first RV or maybe you’re looking for a new one? Do you have specific places you want to visit this year or road trips you just have to take? Are you starting a new small business that you need to focus on growing while you travel and incorporate it into your RV life? Are there RV rallies and show you want to attend?? ?These are all great starting questions to get your mind moving in the right direction! And incorporating your travels into your New Year’s Goals is an awesome way to cover some extra ground, reach new places and keep your RV travel adventure rolling along! Each year I like to pick 1 place that is my big RV travel goal! Last year it was California. When we first set out to RV full-time, my husband and I had our hearts set on taking our family on a big RV road trips across the country. For the first 3.5 years of Fulltime travel we stayed on the east coast- where we felt comfortable. Let year we said we would make it to California by any means necessary- and for us that meant inching our way west right before the Winter. Make a Plan: After you’ve thought out some goals and feel comfortable with the level of difficulty, it’s a great time to take each goal and thoroughly plan how you’ll make it happen. If the goal is too vague and doesn’t include a due date and plan of objectives to get you to the finish- then it’s really more of a dream.To be successful in accomplishing your goals this year, you’ll have to think them through, so you might as well write them down as well. Planning out my thoughts and being able to see them, in detail, usually helps me keep track of the progress I’m making. I’m a doodler! I’ll pend hours just holding a pen in my hand writing down bits and piece of thoughts as they enter and exit my head. once I have them on paper it’s just easier for me to organize them into actual workable goals and objectives. After I get them organized, I’ll them re-write them into a goals planner for the year and keep it in my binder for easy reference. From here I can refer back to them as often as needed and check off the steps as I get them completed. Make it Count: Holding yourself accountable is sometimes easier said than done. We can all make excuses for why things aren’t getting done, why we didn’t do this or that, and why we did something else instead. Telling someone might help keep you motivated to complete your goals, out of sheer pride. By sharing your goals and your plan for attaining them, you’ll likely have more success- since you’ll have at least one other person to help keep you motivated and accountable! Making your goals public is an easy way to hold yourself accountable, but sometimes this isn’t a good fit for everyone- and for those who are hesitant to put yourself out on a limb you can use the calendar method! This is actually my favorite method and I find it works best for me personally, since I like to do things before talking about them. For this option simply keep track of all your goals and objectives on a calendar that you will refer to daily. This could be a virtual calendar with reminders, on your phone, computer or both. Or it could be an old school paper calendar that you write it all in manually and keep close by your side for easy reference. you can use to plan your goals for the upcoming year. This year I need to get organized and bring all the many pieces life, work and RV life together! I realized at some point last year- that I’ve been flying by the seat of my pants on a lot of things and making the most of out final moments by trying to thrive in the chaos… I don’t want to have to do that this year. This year we’re hoping to stay in the Seattle, Washington area. So our travels will definitely be different from what we are used to. We’ll be planning trips from this area outward, but not coast to coast. We want to take a cruise as well as cross the boarder into Canada for a few weeks. Still not totally sure what these adventures will look like, but you know I’ll keep you updated as they come together. In general though, I’d like to focus on my business being better organized. So I’m starting early with planning out my calendar. Every year I get better and better at using my calendar to keep me running smoothly and last year was no different. Although it wasn’t completely without hiccups and some rough patches- looking back on it all I did 90% of what I wanted to do, including self-publishing a book! This year I’m changing which calendar I use and simplifying to just a 2 spread monthly overview. I’m a visual person, so I think this will help me ‘see’ each month’s projects, activities, and goals all at once. I’m also color coding it- and making it public right here, which are two things I’ve never done… Here we go! Take the kids on a Canadian camping trip for 7 days in the summer. Publish the Live.Camp.Work. Podcast weekly and add interviews. Find 3 sponsors for the LCW Podcast to cover basic costs. Publish monthly blog posts with a FREE printable resource in each. Publish monthly newsletter for email subscribers with extra content. Grow the LCW Facebook Group to 1K plus members. Add Pinterest images to each post.